When you enter the Anchorage Museum's Art of the North galleries in the new Rasmuson Wing, you find yourself face to face with a giant color-splashed bear painting by Alutiiq artist Alvin Amason. Above it flies a magpie sculpture, which is flanked by whimsical, textured 3-D pieces swimming with fish, seals and otters. At the bottom of the bear painting, the phrase "Everything I love is here" is written in cursive. 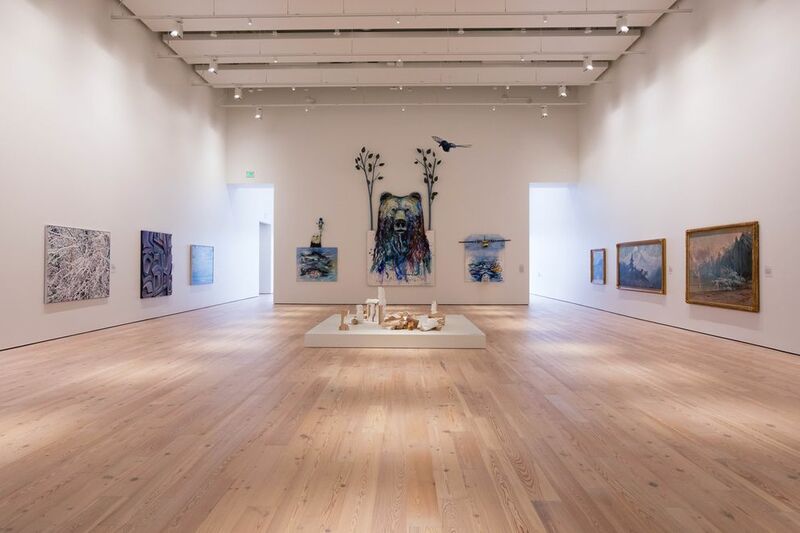 Whether you interpret "here" as Alaska, the museum or both, the ambitious, vibrant, multipart work and the accompanying sentiment are an appropriate intro to the 31,000-square-foot space housing more than 250 works including paintings, sculpture, video and clothing. There's a reason why Amason's work is the initial focal point. "Amason is an important artist and also an advocate for emerging Alaska Native artists. This (piece) is intensely personal. It talks about his own upbringing in Kodiak and his experience with the wildlife in Alaska, and we thought it really talked to the goals of this space," said Anchorage Museum CEO Julie Decker. "This is a space that can accommodate any artwork from small to epic." On Wednesday, media toured the Rasmuson Wing, which also includes a revamped, 12,000-square-foot Alaska Exhibition. The new wing will open to the public on Friday, Sept. 15, as part of a grand-opening weekend of events and activities. The expansion has been in the works for 18 months, designed and built by local firms McCool Carlson Green Architects and Davis Constructors & Engineering Inc. Many items were taken out of storage and repaired, cleaned and evaluated by conservators in the process. The wing was funded entirely through private contributions, including $12 million from both the Rasmuson family and the Rasmuson Foundation. The Alaska Exhibition project cost approximately $13 million and was partially funded by the state. Divided into galleries including "Seeing Nature" and "The Majestic Landscape" and featuring reclaimed heart pine flooring, the Art of the North area includes paintings from artists including Sydney Laurence, Eustace Ziegler, Rockwell Kent, Fred Machetanz, Theodore Richardson and Ruth Sorensen. 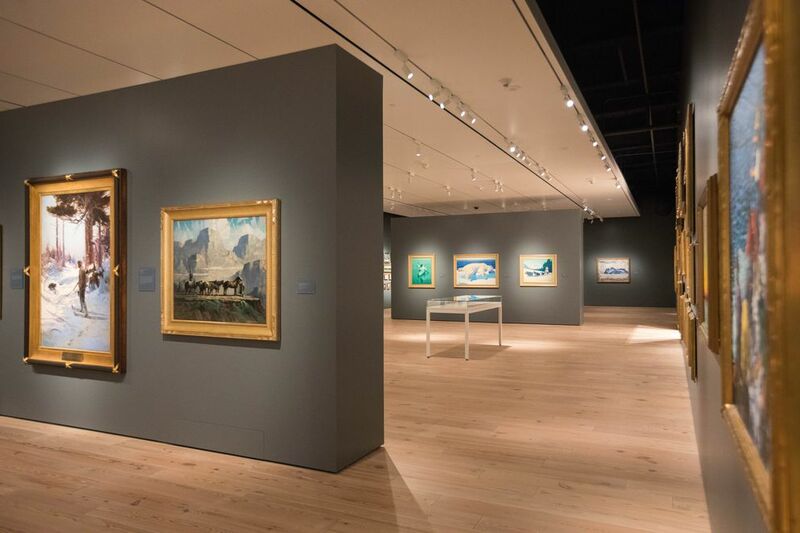 From dreamy clouds over Dillingham to snow-covered Denali to a slice of the northern lights, the paintings offer a striking visual tour of the moods of Alaska's natural wonders. The Art of the North also is a showcase for several contemporary pieces, including a hanging installation called "Idiot Strings IV" by Sonya Kelliher-Combs made of walrus stomach and rawhide. 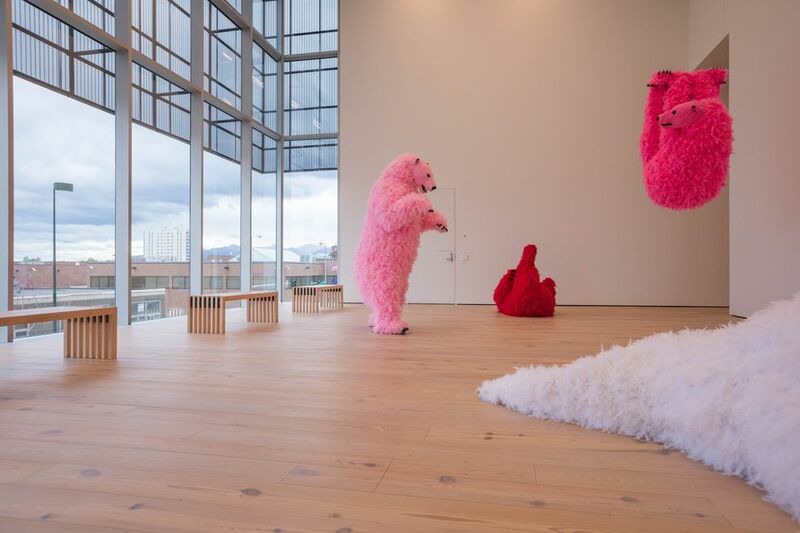 Behind the wall featuring Amason's piece is perhaps the exhibit's most pleasantly shocking surprise: a family of feathered hot pink, red and white, life-size polar bears formed from urethane foam and plastic by Anchorage-based artist Paola Pivi. "When you turn that corner, it's unexpected," Decker said. "They're playful but they also really speak to place. To her (Pivi), the polar bear is an iconic representation of the Arctic." On the other side of the museum, the reimagined Alaska Exhibition is a bright, lively mix of interactive multimedia features and artifacts arranged chronologically and thematically. This is the first time the Alaska Exhibition, formerly known as the Alaska Gallery, has been updated since 1986. Decker said that so much has changed in Alaska since then that it was time to tell the story in a new way. The exhibition begins by looking into how Natives used natural materials to survive and thrive, and ends with a bank of video screens and neon displays about the economy, oil and the future of Alaska. "Before, it was this pretty straightforward timeline where you'd walk through the gallery. This way you can still walk through like it's telling you a story from beginning to end, but now you can also see it in terms of ideas and concepts, like perceptions of the wilderness in Alaska," Decker said. "You see the repetition of our history in some ways, like the boom and bust cycles. But hopefully you see a celebration of our place and the people who helped to make it." In the exhibition, designed by GSM Project of Montreal, visitors can virtually teleport themselves to a selection of Alaska destinations via interactive digital maps. Just tap the location and a 360-degree real-time image of the area pops up on a screen in front of you. Other digital and video elements include clips from movies made when Alaska started becoming a major destination for travelers from the Lower 48, digital encyclopedias where you can look up important figures in Alaska's history, a digital fireplace that creates sparks when you wave your hand in front of it, and archival footage of the Tlingit Eagle-Wolf Dance accompanied by actual regalia, like ornate mittens detailed with pieces of puffin beak. Designing the Alaska Exhibition required serious picking, choosing and paring down. "Before, the Alaska Gallery had more than 1,000 artifacts. Now we're at 300- something," said GSM's Francois Bellehumeur. "We reduced the quantity but made sure whatever we selected definitely supported the storyline." Where: Anchorage Museum, 625 C St. Correction: An earlier version of this story misspelled the last name of Ruth Sorensen.